Imagine you live in a world where one day you wake up and it seems the apocalypse has arrived. Earthquakes, giant tsunamis, floods, fires and a new set of unforeseen catastrophes coming at you from every direction and you never saw any of it coming. 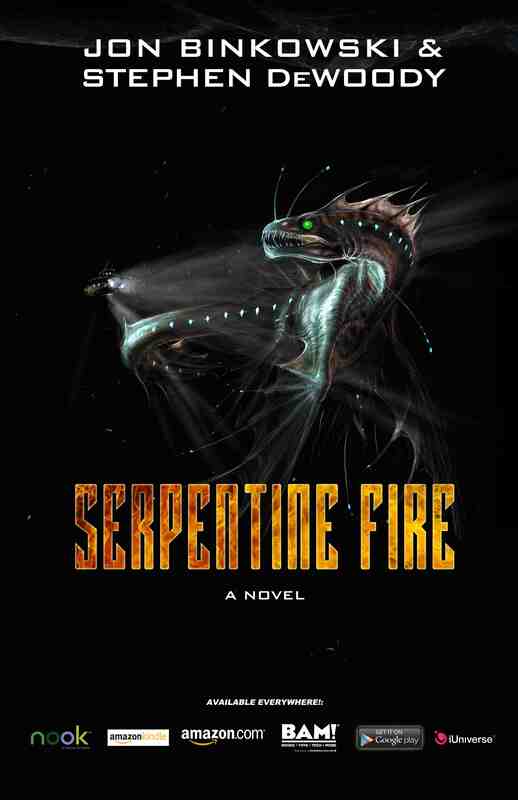 This is the opening premise of “Serpentine Fire,” a new science fiction novel penned by Jon Binkowski and Stephen DeWoody. The new book hurls readers into a catastrophic section of southern California where it feels like the world could very well come to an end before the fifth chapter is over. However, as the chaos of floods, tsunamis and earthquakes calm down and the dust settles, we start to learn what happened. Turns out, there’s a new species of ocean creature that’s just surfaced off the west coast of North America and it ain’t pretty. 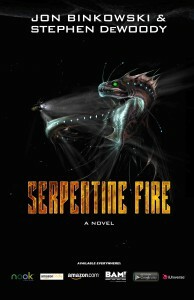 “Serpentine Fire” chronicles how citizens, marine biologists and even the government would handle this new “eel on steroids” to try and get it under control before it potentially destroys life as we know it. Before I go any further, you’re probably thinking: What the hell does any of this have to do with theme parks? Fine question. 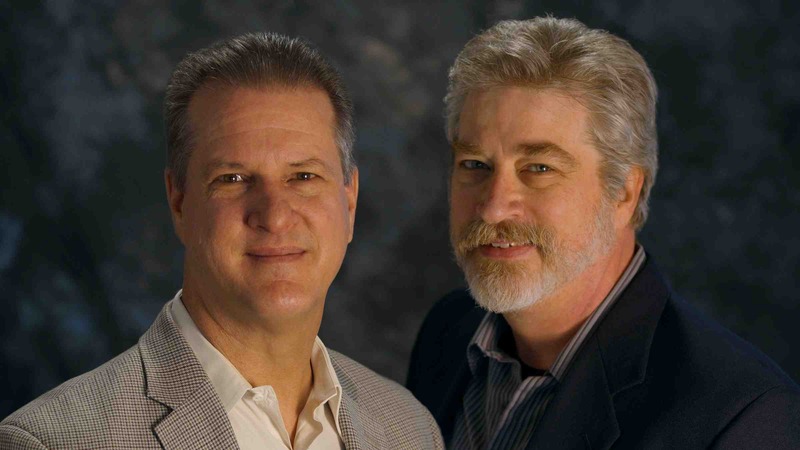 Binkowski and DeWoody are both head honchos over at Renaissance Entertainment in Celebration, Florida and have helped create dozens of theme park projects over the years like the Baywatch Stunt Show for Sea World, to the Pirates 4D movie to the infamous Hard Rock Park. These guys eat, sleep and breathe the theme park business just like you and I and often take inspiration from their experience in the biz to create spin-off projects. 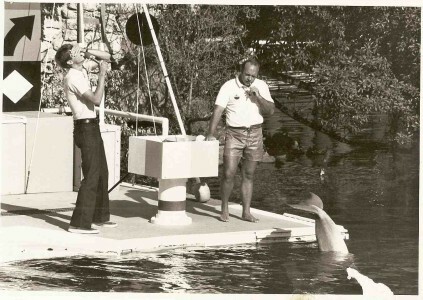 The authors originally met when they started working at Sea World back in the ‘70s in the entertainment department. 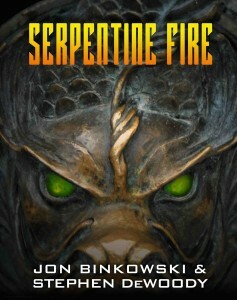 The idea for “Serpentine Fire” popped into Jon’s head right around the time Peter Benchley’s “Jaws” became popular. As it turns out, in order to help spread the word about the book, the publishing company tried to promote it by handing out copies to employees at Sea World San Diego. What better way to get the word out about a man eating shark book than by giving it to employees of a marine life park, right? A few years later in 1975, Universal Studios releases “Jaws” in theaters and was a smash success. It became the highest grossing film of all time until “Star Wars” came along two years later. Meanwhile, Sea World tried to capitalize on the success of the film, even though it had nothing to do with the original “Jaws” and frankly, it scared the hell out of people to go anywhere near the ocean. The public became fascinated with great white sharks, however, at that time no one could keep one alive transporting them from the wild to captivity. So they did the next best thing. Sea World managed to prop a dead great white shark up in a refrigerated glass case with its mouth wide open so tourists could marvel at the beast up close. 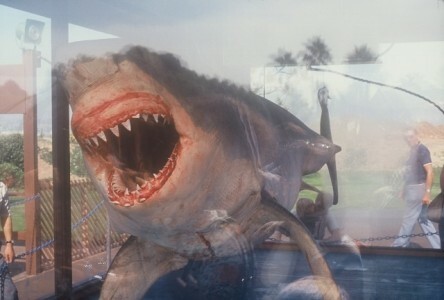 That’s right, during one summer, you could visit a small trailer in Sea World San Diego and examine a full size suspended great white shark carcass and it was included with park admission! This got Jon and Stephen asking themselves: What if there are other species of man eating marine life in the ocean that we don’t even know about? How would people react? We accept that there is this enormous shark, but that’s because it’s in front of us. However, what if there’s more? That’s essentially how “Serpentine Fire” was born. “They stepped inside. The creature was stretched on an improvised deck built onto low scaffolding. Several banks of lights were set up around the perimeter, dimmed to provide barely adequate illumination. There was a stratum of mist in the air, like morning fog just lifting from the ground. The carcass glistened eerily in the dim light. Charles felt an instant coursing of adrenaline. Very few people in modern times had experienced this moment—the first look at an unknown species. If Nessie, Bigfoot, the Jersey Devil, and El Chupacabra had been piled on the table in front of him, he couldn’t have been more amazed. … He had expected to see what the so-called “cryptozoologists” called a Globster: some half-rotten whale or shark or even oarfish; maybe albino or malformed or wrapped in the tentacles of a giant squid … But this—this was the real deal. The adrenaline rush pushed hard at his fight-or-flight reflex; forcing himself to calmly approach this thing was making him confused, intrigued, frightened, giddy, amazed; in short, a little crazy. A variety of incongruous feelings ricocheted inside his head as he took in the massive carcass, resting on a bed of melting crushed ice. 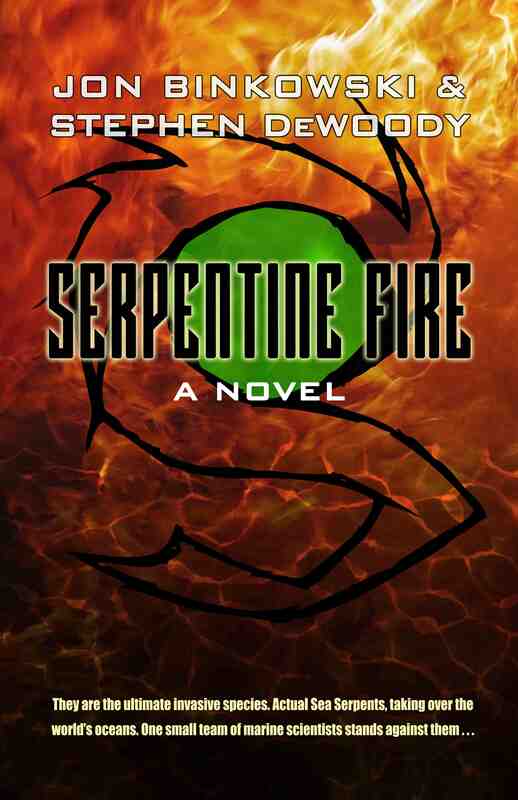 Granted, “Serpentine Fire” is a fictional tale, but Jon and Stephen wanted to at least give it a basis in reality. So they consulted experts and even relied on actual events to give their fish story some credibility. Just a few days ago, researchers in Australia found a shark that they had tagged for research purposes had been completely mauled by something much, much larger. According to the data, the shark had a rapid rise in temperature that corresponded with a sharp 580-meter drop that brought it deep into the ocean. At this point, even with the tracking device data, they have no idea what could have caused this, only speculation. This seriously just happened! Clearly, the public as well as scientists continue to be fascinated (and sometimes scared shitless) as to what goes on beneath the surface of the ocean. Sea World wouldn’t still be in business if we knew all the answers. As a matter of fact, Jon actually came up with the basic concept of one the parks most popular attractions. 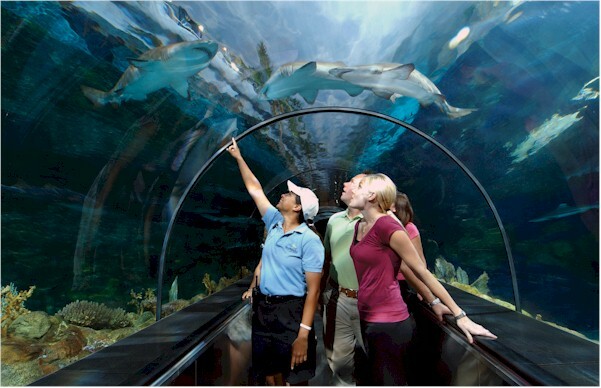 Previous to the Shark Encounter at Sea World parks, guests entered aquariums where they stood in a room with four walls, one of which would be looking into an aquarium. 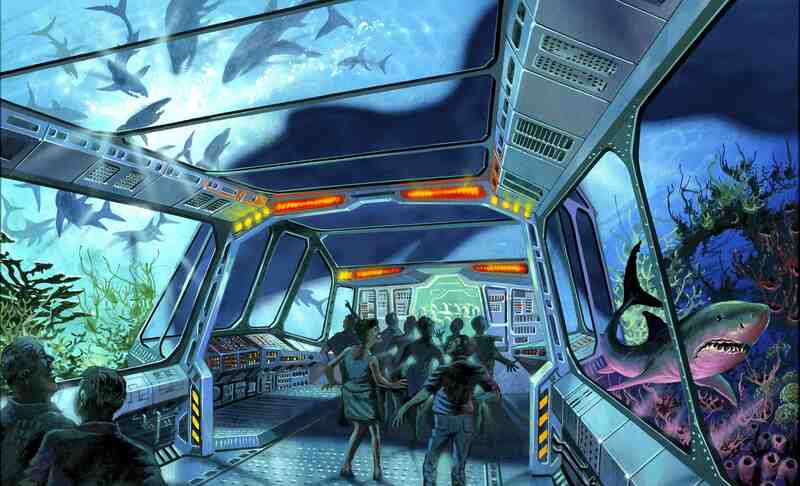 However, Jon devised the concept of creating an aquarium that surrounds the guests on all sides including the ceiling, completely immersing them in a faux undersea environment as seen in the concept art above. 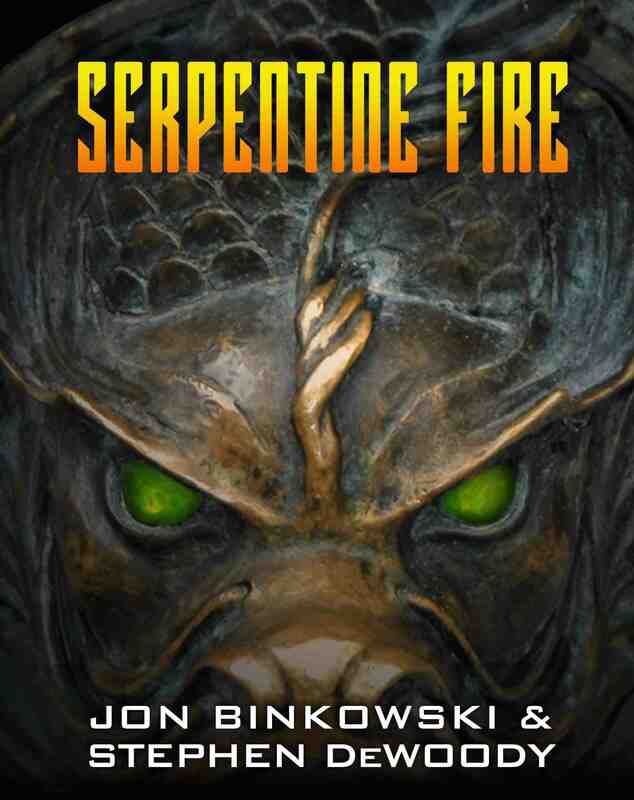 Working for Sea World for over 15 years in various capacities respectively, Jon and Stephen became acclimated in the world of undersea discoveries at a young age and the experience stayed with them long enough that they had to make “Serpentine Fire” a reality. I received an advance copy last week and I can honestly say, it’s a solid read that grips you right from the first page. 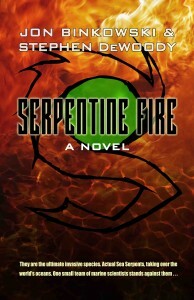 For more information on the book visit www.serpentinefirenovel.com or click on the banner below to order it directly from Amazon. This entry was posted in Outside The Parks, special events and tagged Jon Binkowski, Renaissance Entertainment, Sci-Fi Novel, Sea World, Serpentine Fire, Shark Encounter, Stephen DeWoody. Bookmark the permalink. Trackbacks are closed, but you can post a comment.